Quantzig Unravels the Benefits of Pricing Automation in Their Recent Supplement – Download a FREE Copy Today! LONDON--(BUSINESS WIRE)--A global data analytics and advisory firm, Quantzig, that delivers actionable analytics solutions to resolve complex business problems has announced the completion of their recent free supplement on pricing automation. Pricing automation is the process in which software systems are used to determine prices based on a pre-determined set of rules, as opposed to the manual methods. To establish a robust pricing strategy, businesses will have to carefully address each pricing element. This is of crucial importance as every pricing element is interrelated and the order in which they are addressed makes a huge difference from an organizational viewpoint. Linking the individual pricing elements to the pricing infrastructure empowers organizations to adopt a holistic approach to the development of pricing strategies. In the businesses world, assumptions related to pricing automation state that they help improve efficiency and gain better control over pricing. The reality lies in the fact that it is inefficient to invest in a system without having the core pricing elements in place. Additionally, the benefits offered by a robust pricing automation system are innumerable and most of them generally revolve around- increased profit margin, better pricing control, pricing consistency, and improved efficiency. Though pricing automation doesn’t promise to solve all the challenges associated with pricing, it offers a good opportunity for businesses to scale up and focus on mastering their pricing strategy. Businesses today face several challenges in defining the pricing approach behind pricing automation, but with the right pricing strategy in place, the entire process seems to be less complicated. Get in touch with our experts to understand the processes involved in pricing automation. Analyze your data – It's essential to analyze the quality of internal and external datasets to assess the level of trust associated with prices that are generated using the data. Businesses should also adopt an approach to track data on an on-going basis to avoid inconsistencies. Build your pricing algorithm – Though the term algorithm makes the entire process sound complicated, it is, in fact, possible to develop algorithms that are as simple as the company’s requirements. Test the system – It is necessary to test the pricing algorithm and pricing automation system before implementation. By doing so, businesses can glean insights into the accuracy of the algorithm and the reliability of the generated prices. Request for more information and know how pricing automation can help you gain a winning edge in the market. 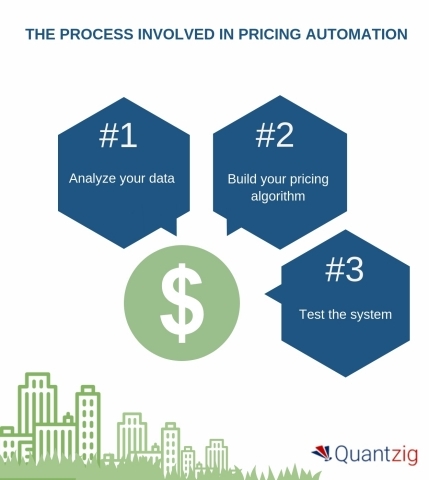 Quantzig has announced the completion of their recent free supplement on pricing automation.